You know how much I love different yarns and all the possibilities they inspire. Last Saturday I went with a friend to the Ace Hotel in East Liberty to check out the Pittsburgh Indie Knit & Spinevent, held in the former YMCA gym. The “boutique hotel” was hopping, serving lunch and drinks and coffee, while eager knitters perused the booths. 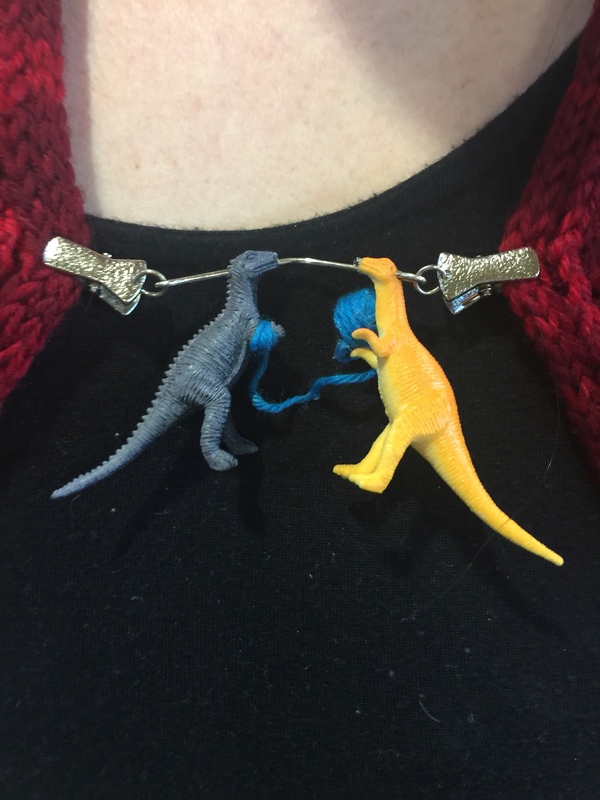 A vendor at one booth was wearing this pin.Two dinosaurs winding yarn! Although the vendor preferred anonymity she was more than happy to share the story of her quirky and creative pin. She told me to google Malojos So fun. Meet the designer of the pin who lives in Chicago About Natalie Have you seen the 14K gold gauge rings she makes? I limited myself to purchasing a single skein of sparkle yarn named “The Shire” ( my first sparkle yarn) HandDyed by Trisha Eliason of Gypsy Stardust Yarn and Fiber Shop. The Ace Hotel hosts Knitting in the Knook every third Tuesday, too. Offering tea and a cozy place to sit and knit. My friend Ann and I went to knit in February and everyone was so nice. That’s how I learned about the Indie Knit & Spin Event. My sister-in-law has a houseful of these ceramic tiles. Seriously, you’d be astounded if you saw her collection. I’ll have to get a number. How convenient they’re squares. AND circles in squares. With just a couple days left to respond to the March Square challenge, I was rummaging in the the built-in China closet. These were standing up in the back along the shelf. I placed them on various tiles and tables around the house to capture them for the challenge . Did you see any donkeys last Sunday? The dining room fireplace tiles and the balls of yarn were right there. I took them out of their reflective yarn bowls and centered them on the square tiles. Fun. The only requirement was your photo had to be a square. Check! Gilly’s been posting squares all month so I’m coming into the challenge at the end here on the 25th day. But I had a circle in a square and it was Gilly who was posting in response to BeckyB of Winchester’s March challenge. my camera found for me…. “Share your happy place” asked Cheri Lucas Rowlands at WordPress. A place you want to return to again and again. A favorite place. Sunrise at a beach, the ocean waves rhythmic sound, and the added bonus – knitting and coffee.